5 CES 2018 Takeaways: What’s next for LTE and IoT? Every year, CES gets bigger and crazier. Navigating 11 Vegas venues, 2.6 million square feet (241,548 square meters) of exhibition space with 180,000 people, and dealing with taxi lines and Uber cancellations is not for the fainthearted. But we loved every minute. IoT once again took center stage at CES – with applications spanning a variety of vertical markets. And while many of the solutions showcased were impressive and exciting for us at Altair, the focus remained on connectivity technologies that are powering this powerful new wave of IoT innovation. Here are some of our key takeaways from this year’s event. Cat-M1 is gaining momentum: We’ve been talking about the differences between Cat-M1 and NB-IoT for a while, and why global operators initially selected one technology over the other. In our CES discussions, it became clear that CAT-M1 is becoming strong everywhere, even among Asian OEMs and operators that until now only considered NB-IoT, due to its perceived cost. The global market is realizing that many powerful IoT use cases need capabilities that NB-IoT does not support. It seems that most large operators will launch both technologies, so Cat-M1 and NB-IoT may not be competing technologies after all. Trackers are the next big thing: Trackers of all flavors were one of the key topics in our meetings. For people, pets and industrial use, advanced LTE-connected trackers are already in high demand, with significant market potential. LTE wearables remain niche: Wearables certainly generated a lot of buzz at CES – from watches to jewelry and fashion – but LTE-powered wearables still remain a niche market. While there is a good case for LTE connectivity for wearables, the market needs more time to develop. However, considering that Apple already launched its LTE watch (see our previous post: I am Apple Hear Me Roar) it’s likely that greater market adoption is only a matter of time. The market is changing: Changes are happening faster than ever, and players across the value chain are making every effort to keep up. They’re focusing on strategies to introduce solutions into the market quickly. We’ll provide more details on some of these strategies in a later blog post. IoT offerings are becoming more complete: IoT applications are wide and diversified, and industry solutions are evolving to provide a complete solution. This will allow smaller end-customers to develop their applications without the normal IoT complexity. This is the first real indication that the market is maturing towards enabling the “long tail” of IoT. It’s an exciting time as the industry is challenged to fit all the pieces together to create true IoT value. 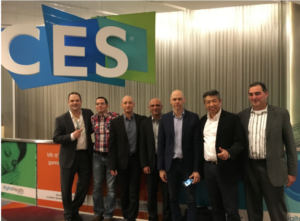 CES provided a fun and inspiring setting for our meetings with global partners and customers. Not only did we strengthen our existing international relationships and partnerships, we had the opportunity to meet a wide array of fascinating companies to forge new ties. While we’re still recuperating from the show, we’re excited about the productive discussions that took place, and look forward to another year of continued success and market leadership.